Mitral valve is a valve of the heart, composed of two triangular flaps, that is located between the left atrium and left ventricle. The mitral valve regulates blood flow between the two chambers. It is also known as the bicuspid valve or left atrioventricular valve, is a dual-flap valve in the heart that lies between the left atrium and the left ventricle. 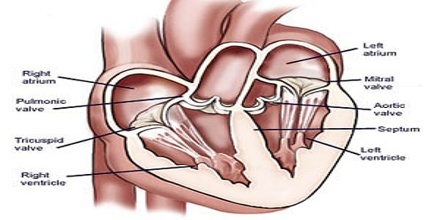 The mitral valve has two flaps (cusps). It is so named because it looks like a bishop’s miter (headdress). As atrial pressure increases above that of the left ventricle, the mitral valve opens. Opening facilitates the passive flow of blood into the left ventricle. Diastole ends with atrial contraction, which ejects the final 20% of blood that is transferred from the left atrium to the left ventricle. The human heart has 4 valves. 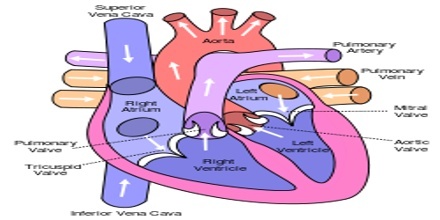 The mitral valve connects the left atrium (LA) and the left ventricle (LV). The mitral valve opens during diastole to allow the blood flow from the LA to the LV. 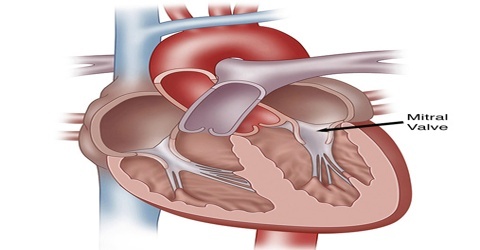 During ventricular systole, the mitral valve closes and prevents backflow to the LA. Mitral valve is typically 4–6 cm² in area. It has two cusps, or leaflets that guard the opening. The anterior cusp protects approximately two-thirds of the valve. Although the anterior leaflet takes up a larger part of the ring and rises higher, the posterior leaflet has a larger surface area. These valve leaflets are prevented from prolapsing into the left atrium by the action of chordae tendineae, the tendons attached to the posterior surface of the valve. About 70 to 80% of the blood that travels across the mitral valve occurs during the early filling phase of the left ventricle. This early filling phase is due to active relaxation of the ventricular myocardium, causing a pressure gradient that allows a rapid flow of blood from the left atrium, across the mitral valve. This early filling across the mitral valve is seen on Doppler echocardiography of the mitral valve as the E wave. Any congenital or acquired disorder of individual components can disturb the finely coordinated mechanisms of the mitral valve and result in an incompetent valve. Reference: medicinenet.com, dictionary.com, medscape.com, wikipedia.